A bulk bag discharger with integral pneumatic conveying system has been specifically engineered by Flexicon to enable companies to stock-pile bulk material in storage silos positioned alongside production process lines and where direct access for large-volume bulk delivery by rail or bulk truck is impractical. The totally sealed system prevents potential release of material into the working environment, helping maintain a cleaner and safer operational plant. 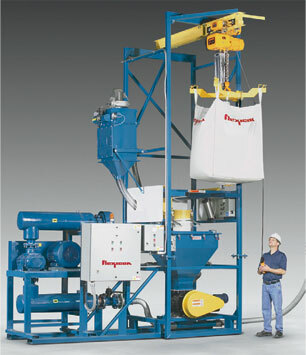 A cantilever I-beam with electric hoist and trolley automatically lifts and positions each bulk bag directly over a collection hopper, a Spout- Lock clamp ring providing the highintegrity seal between the clean side of the bag spout and the clean side of the equipment to eliminate escape of materials and any associated dust particles.